Nature offers the most sophisticated examples of how selectively tailored polymers, polymer assemblies, and interfaces provide well-defined nanoscopic architectures that result in specific (macroscopic) functions. This outstanding ability of property control via molecular and structural design has long motivated researchers to strive for similar power in synthetic nano-materials. However, simultaneously controlling internal morphology, overall shape, and chemical functionality in a single nanoscopic system remains an unmet challenge in polymeric materials. Hence, the ability to realize effective multifunctionality is still in its infancy and unfortunately current examples concentrate on each aspect separately: cooperative dynamic systems are not being fully realized. 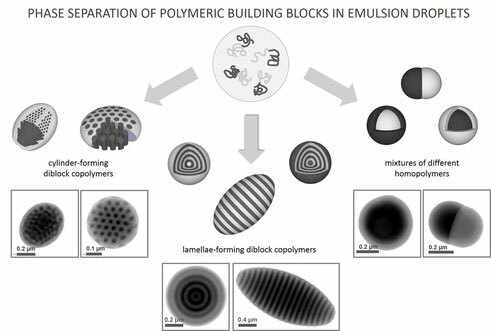 To address this need, research in the Klinger Lab focuses on the concurrence of chemical functionality and morphological control in polymeric nano-particles (see Figure). Following a hierarchical design concept that combines the development of tailor-made macromolecular building blocks with polymeric self-assembly, colloidal chemistry, and interfacial physics, we are developing artificial nano-materials that will serve as building blocks for advanced technologies such as photonics, drug delivery, catalysis and lithography. In polymeric nano-materials such as nanoparticles and thin films, the self-organization of block coplymers (BCPs) is not only dependent on the physical forces between the respective blocks (mediated by the chemical structure of the BCP) but is also strongly influenced by the interfacial forces between BCP and surrounding medium, i.e. the border of the confinement. In existing methods, the interfacial energies of the BCP/air and the BCP/substrate interfaces are used to control the assembly. In contrast, we selectively tailor the interfacial energies of the BCP/water interface via water soluble functional (polymeric) surfactants. In this strategy, the interaction of one block with one specific surfactant is favored. Consequently, changing the surfactant in the surrounding medium or utilizing surfactant mixtures during an annealing step allows for precisely adjusting the wetting behavior. Ultimately, this enables controlling the internal morphology of the nano-material (see Figure above). This strategy is particularly useful to assemble dispersed nanostructures in confinements (nanoparticles) and will allow the design of hierarchical polymeric architectures with precisely controlled internal nanostructures. 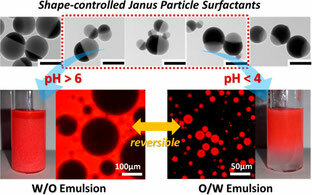 For this, a general concept to tailor the interfacial energies is based on the development of functional surfactants that are complementary to the chemical functionality in the BCPs. Such surfactants can be realized as amphiphilic block copolymers or small molecules with block specific anchoring groups such as hydrogen bonding motifs. In addition to facile structural control, this approach allows for the further chemical modification of the nano-materials by tuning the chemical architecture of the building blocks. Blending the block copolymer with the respective homopolymers not only allows for adjusting the domain size but also enables the introduction of specific functionalities by using homopolymers that contain stimuli-responsive or crosslinkable groups.